Shanghai Disneyland is right on the edge of being a one-day park. On slow days with long hours, getting the major attractions in and taking in the park can be squeezed into a single day. On busier days, you might not get to soak in so much of the park, but we think that's probably not a huge loss. When planning a trip to Shanghai Disneyland, we suggest planning for two days at the park, if possible. This one-day Shanghai Disneyland itinerary is very similar to how we spent our first day at Shanghai Disneyland in mid-November, 2017. We've tweaked it where we made mistakes, and we've included notes that try to explain how we approach this challenge. If you haven't already, we suggest at least skimming our Shanghai Disneyland Fastpass post. Fastpass is not as essential at Shanghai Disneyland as some Disney parks, but it is a key part of the one-day itinerary. You'll also need to download the FREE, official Shanghai Disneyland app in order to grab Fastpass reservations on your phone. Two of the three most popular attractions at Shanghai Disneyland are clones or near clones—Soaring Over the Horizon and Seven Dwarfs Mine Train. Soaring has a different theme and a Shanghai ending, but otherwise it is the same as the Epcot ride. In fact, ours was worse, as the projector seemed to have problems eliminating the gridlines on the screen. We thought these two rides were skippable, but you should know that the Fastpass tickets for these two will run out first, and their lines will be the longest at the park. Mine Train does have a single rider line, too. TRON Lightcycle Power Run was a walk-on at many points in the day, and Buzz Lightyear Planet Rescue was a walk-on the entire time we were there. TRON is super cool AND often a walk-on! Peter Pan's Flight, Roaring Rapids, Dumbo the Flying Elephant, The Many Adventures of Winnie the Pooh, Explorer Canoes, and Jet Packs all tended to have longer waits (20-30 minutes). Peter Pan, Rapids and Winnie the Pooh are Fastpass attractions, while you'll have to wait for Dumbo, Jet Packs, or Explorer Canoes. Rapids was a walk-on at night, and we enjoyed it more at night (though it was a bit chilly). The "kicker" that makes Shanghai Disneyland a little challenging to plan is Challenge Trails at Camp Discovery. This high ropes course was our favorite attraction at Shanghai Disneyland, and it usually has a 30-minute line right when it opens at 10AM. Because of the safety precautions that go into the attraction (i.e. getting everyone properly harnessed) the line moves a little slowly. You'll also have secured a Fastpass for one more major ride. We had two different rope drop experiences at Shanghai Disneyland. Both days, the park was scheduled to open at 9:00AM, but the gates opened at 8:30AM our first day and 9:00AM our second day. Both days, we got on our first ride about 15 minutes after the gates opened after waiting in entry lines. Obviously these times impact how many rides you can get in, especially in the morning when you're racing to beat the crowds. If you stay at Shanghai Disneyland Hotel or Toy Story Hotel, you have access to a special park entrance. We don't know anything about this, but we highly suggest speaking with someone at the hotel about it, as it could save you valuable time to start the day. Time is money in Shanghai Disneyland as much as every other Disney park! Your early goals should be to knock out some of the top tier attractions and specifically to get on Challenge Trails when it opens at 10AM. When you arrive, open your app and grab a Fastpass for Roaring Rapids. You'll probably have to link your tickets to your account on your Shanghai Disneyland App, but that shouldn't take more than a minute or two. If you can't grab the early Rapids Fastpass, grab one for Peter Pan, Winnie the Pooh, Seven Dwarfs, or Soaring for before 9:45 and go ride Rapids standby. You'll want to be on that ride no later than 9:45. We suggest starting your day with Explorer Canoes. This is a bit of an unconventional choice, but the line gets longer, it closes early, and it is a ride only offered at Shanghai Disneyland and Tokyo Disneyland. You could substitute Peter Pan or Seven Dwarfs (via single rider) here if you want something a little more traditional. Grab your second Fastpass just before using your first or immediately after (depending on how your time slots worked out). For your second Fastpass, grab TRON or, if it is a necessity for you, a late Soaring. Depending on the park's precise hours that day, you may be able to fit in a third ride before 10AM, and we suggest Pirates of the Caribbean, which should have a short wait and put you close enough to Challenge trails between 9:45AM and 10AM. At 9:45, or as soon thereafter as you can, head to Challenge Trails. The line is a bit hidden and winding and may look longer than it is. After Challenge Trails you'll use your TRON Fastpass or get in line for TRON. After that, feel free to grab a Fastpass for Peter Pan, Seven Dwarfs, or Winnie the Pooh. 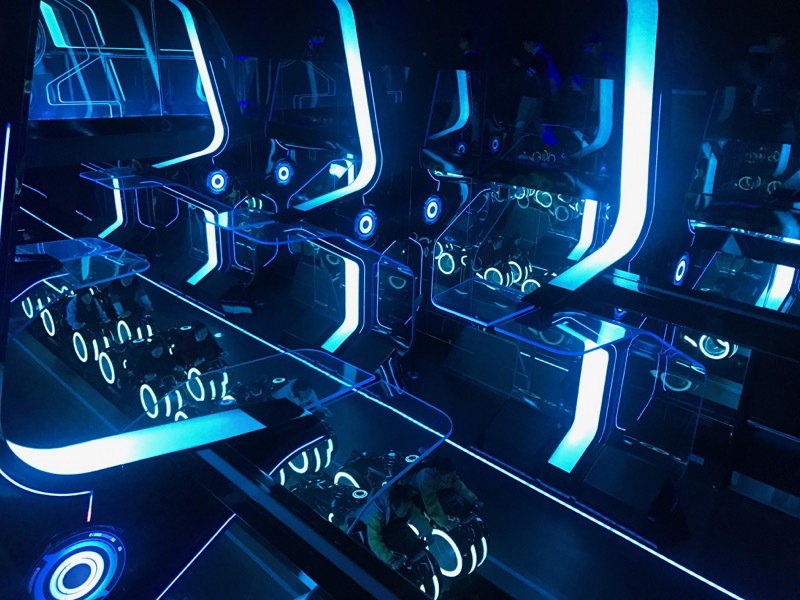 You should also consider grabbing a fastpass to ride TRON at night, which is a cool experience. Unless things are really crazy, you won't need one for Buzz, and after you ride TRON you should be able to ride Buzz as well. By noon, you'll ideally have ridden: Roaring Rapids, Explorer Canoes, Pirates of the Caribbean, Challenge Trails, TRON, Buzz, and secured your Fastpass for one of Soaring / Seven Dwarfs (if these are a priority) or Winnie the Pooh / Peter Pan (if the other two aren't a priority). Now you move into the afternoon, when the goal is to balance rides and shows. Your priority in Shanghai Disneyland for the afternoon should be the shows, unless you're far behind on attractions. If you haven't ridden or grabbed a Fastpass for two of TRON, Soaring, and Seven Dwarfs, prioritize those. Otherwise, plan to see both Captain Jack's Stunt Spectacular and Tarzan: Call of the Jungle. If you have to pick one, we'd suggest Tarzan, but it's a close call. Make the time for Tarzan, you won't regret it! We'd skip Mickey's Storybook Express parade and Golden Fairytale Fanfare (the castle stage princess show) for either Captain Jack or Tarzan. Past the three major attractions, Fastpass is not super important at Shanghai Disneyland, but it will still be a better way to get on the available rides than waiting in line. Plan to skip the lines on any Fastpass attractions you haven't ridden yet, particularly Winnie the Pooh and Peter Pan. Save Jet Packs for nighttime, and visit Voyage to the Crystal Grotto and the "Things to Explore" (above) between Fastpasses and shows. If you absolutely have to wait in a long line for one of Seven Dwarf or Soaring, you should have time for that as well. Get in line at 2:45 to 3PM for 3:15 showing of Tarzan. TRON at night is a great experience! After that afternoon, you'll have a full four hours to finish your day, which is plenty. Ideally, you'll ride Jet Packs and TRON after sunset, which will include at least a 30-minute wait for Jet Packs. At 4PM, if there is anything left you must ride and haven't yet, like Soaring or Seven Dwarfs, get in line. As long as you're done by 5:30, you'll have time to cover the remaining "Things to Explore" by 6:30 and be done with Jet Packs by 7:30. Then head over and grab a spot for the 8PM nighttime show, and your day at Shanghai Disneyland is complete! Have you done Shanghai Disneyland in a single day?